Saturday Night Live returned for its 44th season on NBC last night with host Adam Driver and musical guest, Kanye West. After a long eventful summer break, the cast was back in its weekly grind to put on a big show. 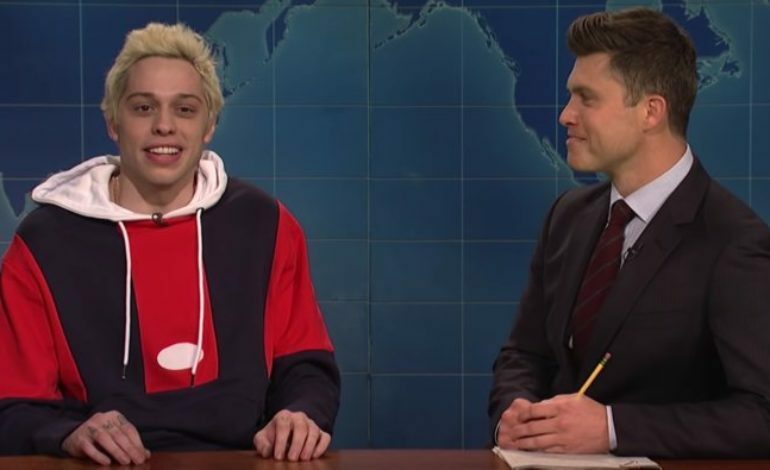 The episode tackled one thing in particular that everyone wanted to talk about – cast member Pete Davidson and singer Ariana Grande were engaged. It was quite a summer for SNL fan favorite Davidson. Reports had come out that the two were dating. Shortly after that, new reports surfaced that they were engaged. It was shocking how fast everything was happening. Many wondered if and how SNL would address this? Davidson, who pops up every now and then for skits, had become the center of attention on last night’s show. He was in most of the sketches, whether he was playing a character or himself. Throughout the whole night, the cast was very teasing of Davidson finally finding love. During the monologue, host Driver was more intrigued about Davidson’s summer rather than everyone else’s: “You’re the one person whose summer I actually wanna hear about,” he said. Davidson can understand why everyone is so confused about the pairing. “I get it. She’s an international pop star, and I’m that guy from SNL that everyone thinks is in desperate need of more blood,” he said. With all of the newfound attention on Pete, Kyle Mooney thought it would be fun to play the role of Davidson in a sketch. It shows a disgruntled Mooney wanting Davidson’s life.